Since 10 Century Jews settle in whole of Europe set up ghettos in the various European cities and Prague was no exception to this trend and thanks to this a unique cultural memorial came into existence here. The Old-New Synagogue, originally called the New or Great Synagogue, got its name in the 16th century, when other synagogues began to be built in Prague. It is the oldest synagogue that is still used for religious services in Central Europe. It was built in around the year 1270. The oldest part is the oblong vestibule with Gothic vaulting to which the double-nave main hall was later added. There are twelve narrow Gothic windows that light up the interior. Twelve vine branches are there to symbolise the twelve Israeli tribes. The exterior has a number of supporting pillars and two Gothic brick gables, which date back to the end of the 15th century. A low annex was later added to serve as a place for female worshippers, thus acting as a substitution for the originally traditional women’s gallery. The building is certainly one of the best examples of early Cistercian Gothic in Bohemia. 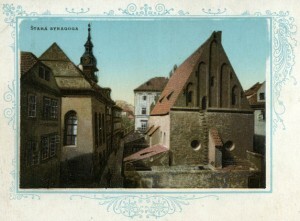 Myths and legends - the synagogue was the main centre of the Prague Jewish community. This is mainly due to Rabbi Avigdor Kara, also a poet, who was witness to the pogrom in 1389. This involved the murder of up to 3,000 Prague Jews. His tombstone, dating from the year 1439, is the oldest in Prague’s Old Jewish Cemetery. Today, there is a copy in the cemetery as the original is housed in Maisel Synagogue. The other rabbi that brought fame to the synagogue was Jehuda Löw ben Becalel, the gentleman that allegedly created the Golem. As a mark of respect, nobody has ever sat in his chair by the altar since his death. Another famous rabbi was the scholar and chief rabbi Jecheskel Landau, known as Noda bi Jehuda. The Jerusalem Synagogue - The Jerusalem Synagogue is an interesting example of Art Nouveau stylisation of the morphology of the Moorish style. The ground plan of the synagogue comprises a basilica type triple-nave with two transverse wings. The main facade displays a large Islamic arch and a rosette window with the Star of David in the centre. Permanent exhibitions - the new exhibition, “The Jewish Community of Prague from 1945 to the Present Day”, presents the hitherto unknown post-war history of the Jewish Community of Prague, using unique photographs and documents and documentary films. It captures key moments in the existence of the Jewish Community of Prague from the end of the Second World War to the present day. The exhibition is organized by the Jewish Community of Prague with funding from Prague City Hall and the Jewish Community of Prague Foundation. The permanent exhibition “Jewish Monuments and their Reconstruction after 1989″ presents visitors with photograpic, graphic and audiovisual resources documenting the course of restoration and reconstruction of Jewish monuments administered by the Jewish Community Prague. The historical mikvah - The historical mikvah in the basement of the building next to the Pinkas Synagogue was discovered during an archaeological survey in 1968. Judging by the surviving masonry and ceramic objects found, it most likely dates to early 16 century, making it one of the oldest proof of Jewish settlement in this area. The old Jewish cemetery in Žižkov - known as the First Jewish Cemetery in Olšany - was established in 1680 as a plague burial ground for the Jewish Community of Prague. Burials took place here during another plague epidemic in the 1820s and then on a regular basis from 1787 until 1890, when a ban on burials within the city came into force. The Jewish cemetery is an historic site of great significance. It is the resting place for some 40,000 persons, including a number of prominent rabbis and scholars. The Prague quarter of Josefov has another four synagogues. Pinkas Synagogue - several times threatened by floods - the last time in 2002. It was built in the second half of the 16th century and serves today as a memorial to Czech and Moravian Jews. Maisel Synagogue - its building at the end of the 16th century was financed by Mordechai Maisel. Klausen Synagogue - built in the 17th century, it today houses an exhibition about Jewish customs and traditions. Spanish Synagogue - the youngest Jewish building in Josefov. Built in the Spanish-Moorish style in 1868, it is now used for concerts of Jewish music.